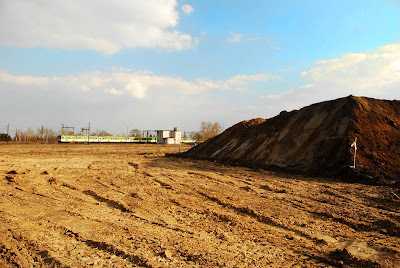 In the few months since work started on clearing the way for the Południowa Obwodnica Warszawy (Warsaw southern bypass), progress has been remarkably quick. Houses, gardens, trees and scrub are being removed. Scores of truck movements a day, diggers of all sorts, the pressure is on the finish before the nesting season begins. Above: Looking east towards ul. Puławska from the Metro access railway line. To the left, houses await demolition. Above: Looking north from the track towards ul. Tramblanki. I talked to a local resident who told me that the people still living in the houses along the path of the bypass have until the end of the month to move out. He was understandably bitter about the prospect. But this road is necessary. The bypass is the S2 express road, which links the eastern and western stretches of the A2 motorway across the south of Warsaw. This has been known about for many years, finally its happening. 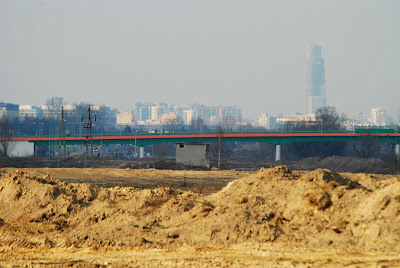 Above: The bypass will run parallel to the railway line which connects Warsaw's Metro to the outside world from near the southern perimeter of the airport to ul. Puławska and beyond. Here we see ul. Hołubcowa crossing the track. In the distance, the path of the bypass. 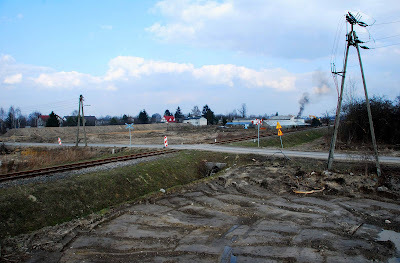 Hołubcowa will cross over both railway and bypass; a viaduct will be built on the spot where I'm standing. Moving further west; the farmhouse on the corner of ul. 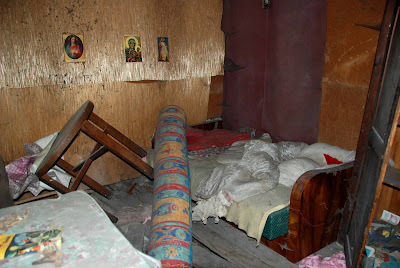 Hołubcowa and ul. 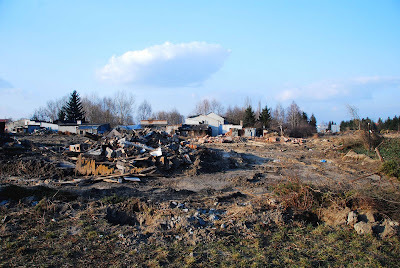 Karnawał is being demolished. A shame, as it was full of rural character, solidly built. 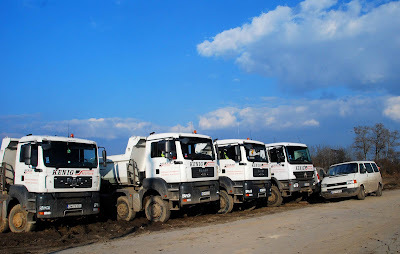 Below: We cross the main Warsaw-Radom railway line, where a row of trucks is parked up on the spot where the bypass will cross the new S79 running down from ul. 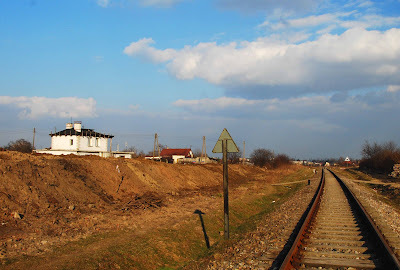 Sasanki; to the south, the S7 will one day run from this spot down to Kielce, Kraków and on to Budapest. Below: Looking north towards the city centre. The S79 will run under the viaduct, past the airport and on to ul. Sasanki. Work, I noticed on Friday from the train on my way in to town, is going on apace at that end too. Trees and summerhouses are being cleared. Below: Looking towards the railway line from the junction. I would guess that the earthwork to the right will form an acoustic screen? It does not look robust enough to carry the weight of an expressway. I shall find out in due course. In the distance, a Radom-bound local train. 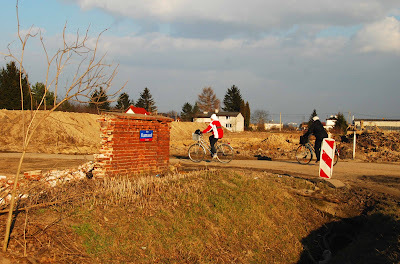 While excited at the idea that at long last Warsaw will get proper road links to the outside world, I am also saddened by the passing of a semi-rural way of life. Below: A summerhouse to the west of the junction. Looking through the scattered magazines (from the 1960s) and toys, I'd guess that this was where a grandmother once looked after her grandchildren, keeping them amused over the summer holidays. Everything must pass.